This mint, unused, antique silver color metal keychain is a reproduction of the Stargate as seen on the hit sci-fi TV series Stargate Atlantis. It features the locking mechanisms and glyphs and the ring measures 1.375″ across. This mint, unused, antique silver color metal necklace is a reproduction of the Stargate as seen on the hit sci-fi TV series Stargate Atlantis. It features the locking mechanisms and glyphs and the ring measures 1.375″ across, with a 24 inch chain. This is a navy blue t-shirt bearing images of Teyla along with the gate and name logo from the hit Sci-Fi Channel television series Stargate Atlantis. This is a charcoal t-shirt bearing the image of the National Intelligence Department symbol, as seen on the hit Sci-Fi Channel television series Stargate. 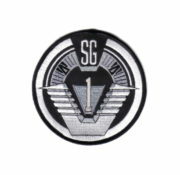 This is a 2 1/2″ high embroidered patch, seen on the berets of the Air Force personnel working in the Stargate command center, on the hit TV show Stargate SG-1, and also worn in the hit movie Stargate by those who went through the gate. 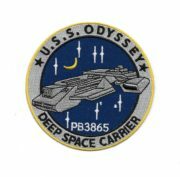 This is a 5″ wide x 4 1/2″ high embroidered patch, seen on the uniforms of those assigned to the new starship the U.S.S. Apollo, a Daedalus class deep space carrier, as seen on the hit TV shows Stargate Atlantis and Stargate SG-1. This is the second generation of Earth battles cruisers. 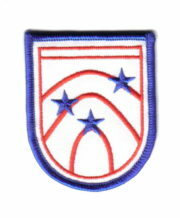 This is a 4″ wide embroidered patch, seen on the uniforms of those assigned to the new starship the U.S.S. Odyssey, the second Daedalus class deep space carrier, as seen on the hit TV shows Stargate Atlantis and Stargate SG-1. This is a cloth baseball style hat with a mesh back with the Stargate SG-1 Air Force Wings logo patch attached to the front. This is a new, never worn hat, available in either blue or black. If you do not choose we will send our choice. This is a cloth baseball style hat with a mesh back with the Stargate SG-1 and original movie, Airman Beret logo patch attached to the front. This is a new, never worn hat, available in either blue or black. If you do not choose we will send our choice. This is a cream t-shirt bearing the image of the original main cast standing under the words “Original HomeWorld Security” and above the words “Fighting Alien Terrorism Since 1997” from the hit Sci-Fi Channel television series Stargate SG-1. This is a 100% cotton design, new, never worn shirt, now out of print. This is a set of four 8″ diameter collectors bone china plates that is a limited production run of only 1000 of each. Produced in the fall of 2004 in Great Britain, this is the first series of plates produced for the hit Sci-Fi Channel TV Series Stargate SG-1, of which less than half of the total has been imported into the U.S. 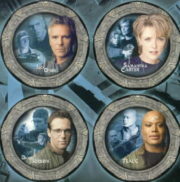 This plate set contains the four main characters of O’Neill, Jackson, Carter and Teal’c. Packaged in attractive illustrated boxes, they are new, never used plates. This is a cloth baseball style hat with a mesh back with the Stargate SG-1 Earth logo patch attached to the front. This is a new, never worn hat, available in either blue or black. If you do not choose we will send our choice. 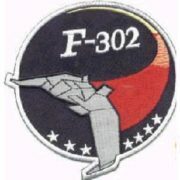 This is a 4″ wide embroidered patch, seen on the uniforms of those who fly the new aircraft, the F-302, on the hit TV show Stargate SG-1. 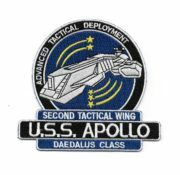 This is a 4″ wide embroidered patch, seen on the uniforms of the main group of Stargate travelers, on the hit TV show of the same name. Published in 2001 by Titan Books in Great Britain, this is a 160 page, trade paperback. It is a comprehensive, fully authorized guide to the first two seasons of the hit TV show Stargate SG-1, containing many photos, and packed with character profiles, interviews, behind-the-scenes secrets and an episode guide. Published in 2002 by Titan Books in Great Britain, this is a 160 page, trade paperback. It is a comprehensive, fully authorized guide to the third and fourth seasons of the hit TV show Stargate SG-1, containing many photos, and packed with character profiles, interviews, behind-the-scenes secrets and an episode guide. Published in 2003 by Titan Books in Great Britain, this is a 160 page, trade paperback. It is a comprehensive, fully authorized guide to the fifth and sixth seasons of the hit TV show Stargate SG-1, containing many photos, and packed with character profiles, interviews, behind-the-scenes secrets and an episode guide. Published in 2005 by Titan Books in Great Britain, this is a 160 page, trade paperback. It is a comprehensive, fully authorized guide to the seventh and eighth seasons of the hit TV show Stargate SG-1, containing many photos, and packed with character profiles, interviews, behind-the-scenes secrets and an episode guide. Published in 2006 by Titan Books in Great Britain, this is a 160 page, trade paperback. It is a comprehensive, fully authorized guide to the nineth season of the hit TV show Stargate SG-1, containing many photos, and packed with character profiles, interviews, behind-the-scenes secrets and an episode guide. This is one of a set of four 8″ diameter collectors bone china plates that is a limited production run of only 1000 of each. 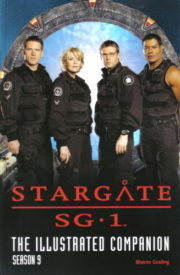 Produced in the fall of 2004 in Great Britain, this is the first series of plates produced for the hit Sci-Fi Channel TV Series Stargate SG-1, of which less than half of the total has been imported into the U.S. 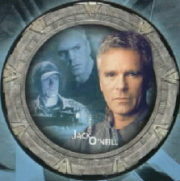 This plate set contains the four main characters of O’Neill, Jackson, Carter and Teal’c, and this one features Jack O’Neill. This is a set of four 8″ diameter collectors bone china plates that is a limited production run of only 1000 of each. Produced in the fall of 2004 in Great Britain, this is the first series of plates produced for the hit Sci-Fi Channel TV Series Stargate SG-1, of which less than half of the total has been imported into the U.S. This plate set contains the four main characters of O’Neill, Jackson, Carter and Teal’c, and is one of only a few MATCHED numbered sets available and ONLY from us. We are the ONLY dealer who was able to match the random numbers they shipped (due to the large order we received) and make these VERY RARE sets. This is a set of five 8″ diameter collectors bone china plates that is a limited production run of ONLY 144 making them a very rare collectible. Produced in the 2007, this is a 10th anniversary release of plates produced for the hit Sci-Fi Channel TV Series Stargate SG-1. 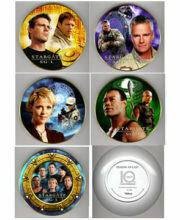 Only produced as matched numbered sets, this plate set contains the original four main characters of O’Neill, Jackson, Carter and Teal’c on their own plates as well as a cast plate with them plus the newest members of SG-1 Mitchell and Vala. They were issued without paper certificates with the COA number of the set on both the back of the plate and on the sturdy cardboard box they are packed in. They are new, never used plates, long sold out. This is one of a set of four 8″ diameter collectors bone china plates that is a limited production run of only 1000 of each. Produced in the fall of 2004 in Great Britain, this is the first series of plates produced for the hit Sci-Fi Channel TV Series Stargate SG-1, of which less than half of the total has been imported into the U.S. 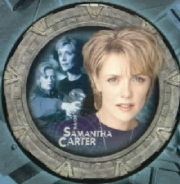 This plate set contains the four main characters of O’Neill, Jackson, Carter and Teal’c, and this one features Samantha Carter. 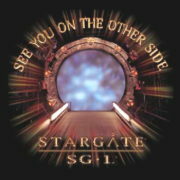 This is a black t-shirt bearing the image of the Stargate as seen on the hit Sci-Fi Channel television series Stargate SG-1, with the phrase “See you on the other side” above it and the show name logo below.